Home » calves » knots » legs » massage » massage roller » quattro pro » quattro pro massager » roller » running » tool » Quattro Pro Massager Review: Tackle Those Knots in Your Calves! 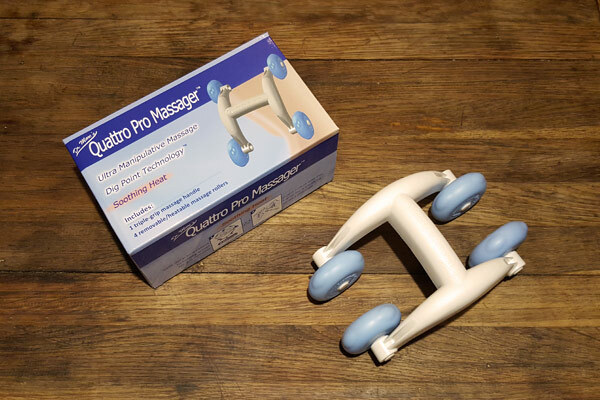 Quattro Pro Massager Review: Tackle Those Knots in Your Calves! By far, the most popular post on my blog has always been my article on treating knots in your calves. 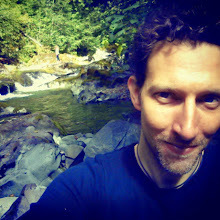 When I first wrote that post I wondered if I was the only runner who dealt with chronic leg knots. I now feel assured that I'm far from alone in my calf woes. After receiving so many comments on my blog, email and Facebook page about it, I'm now convinced that every serious runner out there struggles to keep leg muscles loose. In the midst of all these comments came an offer from the good people behind the Quattro Pro Massager. They read my post and asked if I would try their nifty new tool and share my thoughts about it. Why not? While a one-time cure for calf knots seems unrealistic for many runners, including myself, there are tools that will keep them at bay and I'm always happy to try a new one. The Quattro Pro, designed by chiropractic physician Dr. Marc, is a handheld massage tool that features four blue roller wheels—hence, the "quattro" in the name. It is made of a dense plastic and my first impression was that it resembled the frame of a toddler's toy car. It is on the larger side for a handheld rolling massager, measuring about 9" (22 cm) in length. The Quattro Pro Massager is a clinical-strength massage tool designed for home use. The easy-to-configure positions of the heatable wheels allow for effective muscle penetration that provide maximum tension relief, a more soothing massage and promotes better muscle health." The wheels of the massager are not only removable, but also reversible, meaning you can take them out, flip them around and insert them into the opposite side of the plastic frame. This gives you a variety of configuration options for how wide you want the massager to reach. If you're feeling a little crazy then you can have each row of wheels a different width. I found it takes a bit of elbow grease to "punch" the wheels in and out of their sockets, but it wasn't too hard and I take it as a good sign of how sturdy this plastic massager is built. It's not going to bend or break easily under pressure, so you can really bear into it if you want a deep tissue effect. One of the more unique features of this massager is the ability to heat the wheels, but it does take a little time and energy. You first have to boil a pot of water and then let the wheels soak for 2-3 minutes. They are not microwaveable. 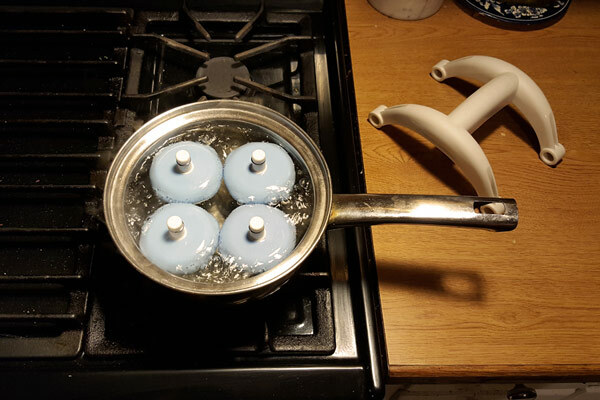 After carefully removing the wheels from the boiling water with a pair of tongs, let them cool to the point where you can safely touch them (less than a minute for me) and punch them back into the frame. For the next several minutes you'll have a nicely heated massage roller. As you can see from the photos, each wheel has four evenly spaced nubs around the rim to give a little extra oompf to your massage. Common everyday sore, achy, tight muscles: use light pressure, long slow strokes for 5-10 minutes. Chronic trigger points, knots, deep tissue pain: use light to heavy pressure, long and short multi-directional strokes for 15-20 minutes. My first real test of the Quattro Pro was on my girlfriend. She often has knots behind her shoulder blades after a long day of desk work—common for many people—and casually asked if I wanted to try my newly-arrived massage tool on them. We didn't bother heating it up that time, but she was still very happy with the results. The width between the wheels was just right to hit the knots between both her left and right shoulder blades simultaneously, and the spacing between the two rows of wheels allowed easy strokes to cover most of her back. It quickly became clear that a lot of thought went into this very functional design. The only drawback to using the Quattro Pro as a back massager is that you really need another person to do it; self-massaging your own back with it isn't very practical unless you're a contortionist. This wasn't much of a concern for me because back massages aren't my priority, and that's not why I was given the tool to review. As Dr. Marc's representative told me, the Quattro Pro is commonly marketed and perceived as a back and neck massaging tool, but they want to show that it works very well for extremities, too. That means arms and legs. Since calf knots are the big issues for me and my fellow runners, this was the real test. I initially ran the Quattro Pro on my calves in "cool mode" shortly after unboxing it. This was easy to do without the aid of another person. The narrower positioning of the wheels fit very well to cover the width of my leg. Again, the spacing of the two rows of wheels was just right to allow full coverage with minimal strokes. In other words, I only had to roll it up and down a short distance to have the entire back side of my calf, and all my knots, covered by one or more wheels. Like with my girlfriend's back massage, I was impressed with how intelligently the wheels were positioned for this purpose. To get the full effect, however, you really need to heat this thing up. The first time I did this, I groaned at the thought of waiting for a pot of water to boil before I could get at it, but of course that's a very first world problem. It didn't take long and it wasn't hard to find a few minutes of Youtube videos to distract me while I waited. I was even lucky to stumble across a montage of 1980s cartoon opening themes that totally absorbed me and made the time fly. Before I knew it, I was popping the hot wheels into place and letting my tight calves know who's in charge. While using the massager when it's cool felt okay and hit all the right spots, trying it out in "hot mode" brought the experience to a whole new level. OMG THIS THING FELT AMAZING!!! If you read my previous post about getting knots out of your legs then you'll know that I referred to knot massage options as "torture tools." Whether it's a foam roller, a rolling stick or a lacrosse ball, massaging knots in my calves has always required gritting my teeth and pushing my pain threshold to its limits. I can honestly say that a hot Quattro Pro Massager was the first calf-massage experience I ever had that actually felt pleasant and soothing. I really didn't want it to end, but eventually the wheels cooled off and I had to admit my calves had been given enough attention for the day. Life goes on. So yes, I was very happy with this new tool. It's worth pointing out that it works equally well on hamstrings, thighs and the bottoms of your feet, though calves remain my primary concern. I only have a couple negative evaluations, and they're fairly mild. One is that if you're massaging your own calves then it's difficult to get leverage for a really deep tissue effect, as you can attain easily by using gravity with a foam roller or lacrosse ball. The second is the time and effort it takes to heat up the weels, along with the inevitably limited period of heat before the wheels cool off. That really comes down to a few minutes of waiting for a nice, hot massage, so I almost feel lazy and guilty complaining about it. Wheel spacing and adjustable positions are designed very well for thorough coverage of back, neck, arms leg and whatever else you can think of. Heated wheels feel great and eliminate much of the pain from massaging knots. Easy to self-massage your own calves, albeit with some leverage constraints. Sturdy design allows you to be fairly rough with your massages, if you're into that kind of thing. If you want a back massage you'll need a willing partner (personally, I find using either a Theracane or a lacrosse ball between my back and a wall to be an easy way to self-massage the knots in my back). 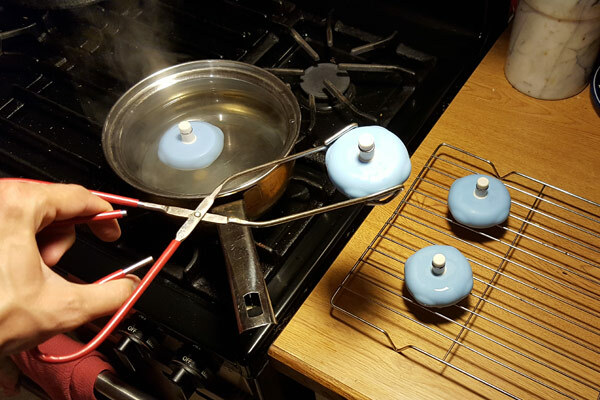 Heating wheels require time and effort of first boiling water. Heated rollers start to cool off immediately so you have a somewhat short window to use it. When massaging your own legs, it can be difficult to attain the intensity of a foam roller or lacrosse ball. The Quattro Pro Massager retails for just under $40. This little massager really allows me to hit the right places. I love how I can configure the wheels how I want to more precisely hit the places I'm trying to massage. Easy-to-use massager with heatable wheels that effectively massage and penetrate muscles to help relieve tension.